A systemic failure analysis aids in identifying the root problem of a gear failure, and once identified, there are ways to avoid the most common culprits. The strength, toughness, and cost effectiveness of steel make it the most widely used material in gear-making . Different steel compositions offer an array of hardness and hardenability depending on the carbon and alloy contents of the steel type. Heat-treat response and surface treatment alter the microstructure and influence the wear and fatigue properties of a gear material. In addition to metallurgical factors, gear performance also depends on lubrication effectiveness, contamination to the system, gear design, misalignment, surface finish, damage through machining/processing, and severe loading or impact loading . 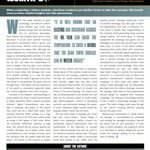 Considering the many factors involved in gear material, design, manufacture, and service life, the ability to properly assess a gear failure is a valuable tool in identifying the root cause of the problem and implementing corrective actions to prevent early failures or to extend gear life. There are diagnostic techniques such as thermal imaging, oil analysis, wear metal analysis, and vibration analysis that allow for detection of process variations and early recognition of gear problems, but when a part has failed, a systemic failure analysis is the procedure that will aid in determining a root cause. To begin a failure analysis, an understanding of the design and function of the gear is important. Gears will typically have a high concentration of compressive and sliding stresses along the active profile, a concentration of tensile stress at the root radius of the loaded side of the teeth, and a concentration of compressive stress at the root radius of the opposite or non-loaded side of the teeth . 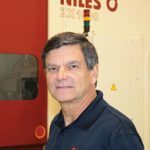 Gathering information about the processing history and the service life of the part is the next critical step in the analysis. Information about loading, temperature, runtime hours, service history, expected life, and lubrication type, as well as pertinent drawings, specifications, and part numbers are valuable pieces of information. It is important to understand the specifications that are called out on the gear under analysis and whether the part meets those specifications. It is also important to understand if the specifications adequately describe the needs of the part. The inspection of the failed part begins with a visual examination and thorough documentation of findings. Visual inspection can be aided with non-destructive testing such as magnetic particle inspection or dye penetrant inspection to check for cracking. After visual examinations, samples should be selected for higher magnification inspection, possibly including scanning electron microscopy (SEM). The large depth of field and high resolution of SEM analysis can help identify fracture modes and identify an initiation point. These are keys to understanding why a part has failed. SEM equipped with energy dispersive spectroscopy (EDS) allows for compositional analysis and can be used to check for nonmetallic material at initiation sites. Light microscopy is used in failure analysis to inspect for surface asperities (such as cracking, intergranular oxidation, or inclusions) and observe the microstructure of the part by using an etchant to reveal the microstructure including the phases, amount of retained austenite, carbides, and non-martensitic transformation product. Additional analysis should include testing for other specified properties such as chemical analysis, hardness, case depth, depth of intergranular oxidation product, steel cleanness, or residual stress. Knowledge of common failure modes will allow for possible determination of the root cause of the failure or damage. Published literature offers procedures to follow and references to guide a gear failure analysis [1, 4, 5]. 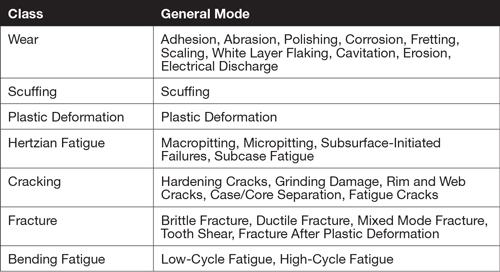 AGMA 1010 F14 outlines seven classes and modes of failure: wear, scuffing, plastic deformation, Hertzian fatigue, cracking, fracture, and bending fatigue, as shown in Table 1. In an analysis of more than 1,500 gear failure studies, the three most common failure modes were tooth-bending fatigue, tooth-bending impact, and abrasive tooth wear . These three modes will be investigated further, and the importance of using the right material to avoid these failures will be highlighted. Tooth-bending fatigue is the most common mode of failure in gearing and results from cracking under repeated stresses below the ultimate tensile strength of the gear . Notches, grooves, surface discontinuities, and material imperfections will decrease the stress that can be withstood for a fixed number of cycles. In a classic tooth-bending fatigue failure, the origin of the failure is at the surface of the root radius of the loaded side of the tooth and is at the midpoint between the ends of the tooth. If there is a misalignment in the system, this can result in fatigue initiating in areas where stresses are exceeding design limits. Fatigue life can be extended by maximizing the ultimate tensile strength of the material. Resistance to bending fatigue can be increased by achieving an adequate heat treatment resulting in a tempered martensite structure free from bainite, pearlite, and network carbides in a case structure. During case carburizing, intergranular oxidation (IGO) will form (unless carburizing is done via vacuum carburizing) and can act as a stress raiser in a root fillet. Minimizing IGO by way of the heat-treat cycle is beneficial, as grinding in the root fillet area is difficult. Maximizing the residual compressive stress in a case also improves fatigue life. This can be achieved by using a low carbon content and by shot peening after heat treatment, as well as by nitriding . Finally, clean steel should be used in the manufacturing of gears to optimize fatigue life. Limiting the number of inclusions results in a lower probability of inclusions being located in the high stressed zones of the root fillet. Tooth-bending impact is often the result of a shock-loading condition, when a gear tooth will yield due to a bending stress, which exceeds the yield strength of the material. To address this issue, the gear material should have adequate tensile strength, yield strength, and ductility to survive severe conditions. The mechanical properties are dependent on the chosen material and the heat treatment of the gear. Abrasion occurs when material is removed or displaced due to the presence of hard particles. Examples of hard particles that cause abrasion include: metallic debris, scale, rust, sand, and abrasive powder. The particles can be suspended in the lubricant or embedded in the flanks of gear teeth . While abrasive wear is primarily controlled by maintaining a gear system with minimal contamination, materials still play a role. For example, internally generated wear debris can be minimized by using surface-hardened gear teeth via carburizing or nitriding. Macropitting due to Hertzian fatigue contact stress, in which cracks initiate at the surface or subsurface of the gear tooth, is another common failure mode in gears . The combined effect of the rolling and sliding stress can result in near-surface fatigue cracking at the point of maximum shear stress below the contact surface . Cracks will propagate toward the pitchline and away from the sliding direction, as shown in Figure 1. A pit forms when small cracks grow long enough to separate a piece of material at the surface. Specific modes of macropitting include: nonprogressive, progressive, point-surface-origin, and spall. As with other failure modes, selecting the proper steel composition and getting adequate heat treatment (yielding a martensitic microstructure and a limited amount of retained austenite) are important. Using high-strength steel as well as surface hardening via carburizing or nitriding can also reduce macropitting . Shot peening also helps induce compressive stresses to a gear tooth to reduce macropitting. 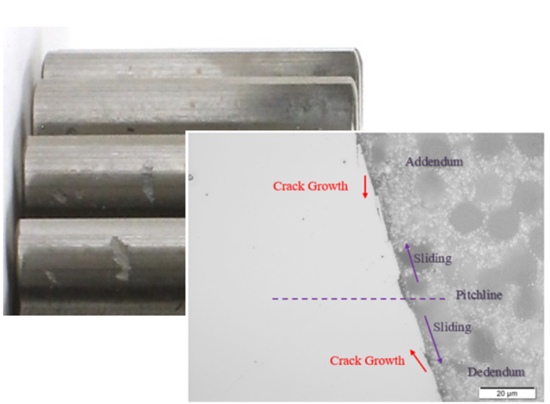 Finally, inclusions at the surface and subsurface can act as stress raisers for crack initiation, so using clean steel is beneficial in protecting against macropitting . Failure analysis can be used to identify a root cause for a gear failure, and material properties and characteristics can contribute to these failures. 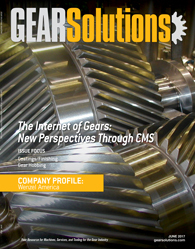 Some of the common ways that gears fail can be avoided by choosing the right material and ensuring proper processing. There are usually trade-offs to consider, such as strength versus ductility and surface enhancements versus cost. Specifying cleaner steel is an improvement that offers protection against many of the common failure modes. Although there are cost implications, advancements in air-melt quality steel has made the use of clean steel a much more cost-effective solution in preventing gear failures. American Gear Manufacturers Association (2014), ANSI/AGMA 1010-F14, Appearance of Gear Teeth — Terminology of Wear and Failure, American Gear Manufacturers Association. ASM International Handbook Committee. (1996). ASM Handbook, Volume 19 – Fatigue and Fracture — 54 Contact Fatigue of Hardened Steel. ASM International. ASM International Handbook Committee. (1996). ASM Handbook, Volume 19 – Fatigue and Fracture — 49.3 Notch Sensitivity and Internal Defects. ASM International. 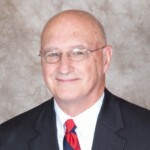 Becker, William T. Shipley, Roch J. (1986; 2002). 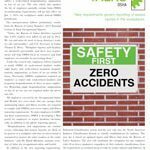 ASM Handbook, Volume 11 – Failure Analysis and Prevention — 74. Failures of Gears. ASM International. Becker, William T. Shipley, Roch J. (1986; 2002). ASM Handbook, Volume 11 – Failure Analysis and Prevention — 74.6 Classification of Gear Failures. ASM International. Rizvi, Syed Q. A. (2009). 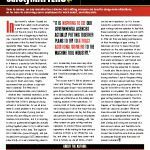 Comprehensive Review of Lubricant Chemistry, Technology, Selection, and Design — 8.3.3 Causes of Gear Failure. ASTM International. is the manager of the Applications Metallurgical Laboratory at TimkenSteel’s Technology Center. 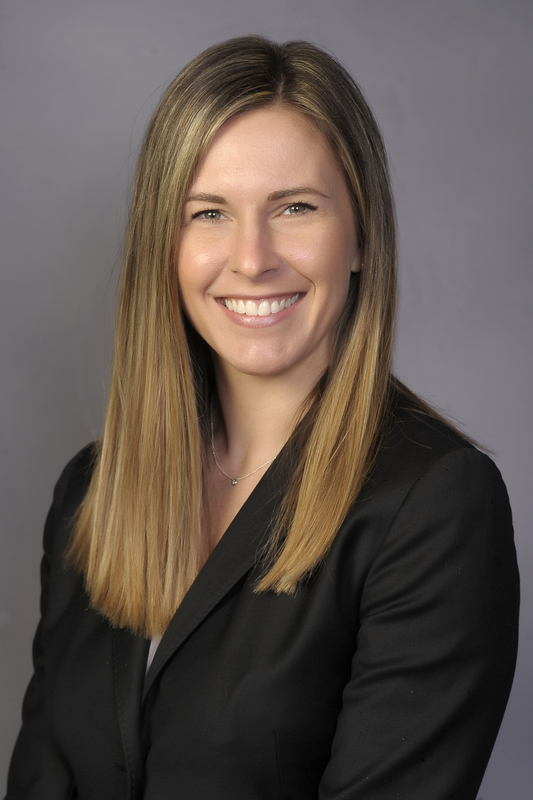 She is a graduate of The Ohio State University with a bachelor in materials science engineering and Case Western University with a master of engineering. Koutsis can be reached at anne.koutsis@timkensteel.com.